Probably later C12 in origin, most of the church is C14 with a C15 tower. The windows were almost all replaced in the C19. 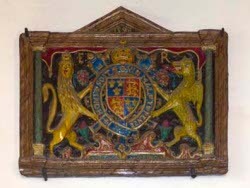 The Royal Arms of 1598 are the oldest in Sussex. 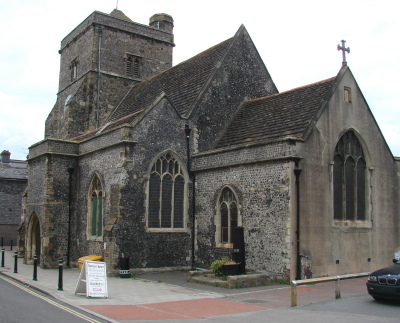 Built as a chapel for Cliffe in South Malling parish, the dedication demonstrates the link to Canterbury through Malling Deanery. Assuming it is original, it suggests the chapel was founded in the late C12, when the dedication was most frequently used, though there is no written record before 1320 (2 p157) and it is not known when it became parochial. A blocked west lancet in the narrower north aisle, set in thicker walling and hidden outside by a later buttress, shows that the church had at least one aisle in the C13 and by the later north west window is what appears to be the jamb of a window or doorway, which is probably of the same date. The short chancel may keep the dimensions and even some walling of its putative C12 predecessor, for there was a lane to the east which would have prevented it being lengthened. However, the walls are rendered or refaced, so this remains uncertain. Following the reconstruction of the church in the C14, the plan of the western part of the church is almost square. The arcades are the best evidence of the rebuilding, with octagonal piers and heads with two hollow chamfers. The north one was clearly rebuilt then, though there is nothing to show whether there had been an earlier south aisle, for in the present one nothing is older than a C14 piscina (see below). The related trefoiled clerestory openings, placed above the piers, date from the same time. They open into the aisles after these were heightened. Beneath later plaster, the nave roof-timbers are C14, though the braces are boxed in. Either then or in the C15 a rood-stair was built, of which the upper entrance remains above the north arcade. 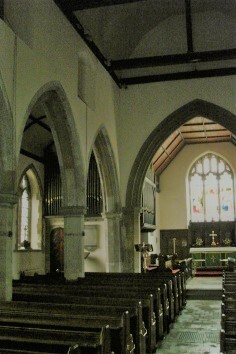 It is placed, unusually, a bay to the west of the chancel, suggesting the sanctuary was extended into the nave to overcome the liturgical problems caused by the short chancel. The late C15 tower, of flint and stone in an irregular chequered pattern, has diagonal buttresses and a four-centred west doorway with foliage in the spandrels. Though renewed like the others, the panelled tracery of the west window is accurate – the weathered head-stops may be original. The two-light square-headed bell-openings, though renewed c1980 (vidi), and the low tiled cap resemble those in the Burrell Collection drawing (1793); however, this shows battlements, not the present plain parapet. The tall tower arch has heavy semi-octagonal responds and a double-chamfered head. Conceivably the aisles were also heightened in the late C15, for the roof timbers look to be of this date. However, this more usually happened after the Reformation when galleries were inserted and the south aisle is known to have been altered in 1752. This was probably the work of J Daw, who died that year (SAC 142 p109), especially as his family firm donated a marble font (long gone) shortly afterwards. Colin Brent (p209) notes the uncompromisingly central position of the porch, as approved in C18 notions of symmetry, and dates it to this time. Its exceptional height, as evident on Horsfield’s drawing (Lewes I p288) and the gothic detail (recalling that of Daw’s St Michael) also support this dating. The apparently old roof-timbers were possibly re-used, whilst the present panelled tracery is certainly C19 for the Sharpe Collection drawing (1803-04?) 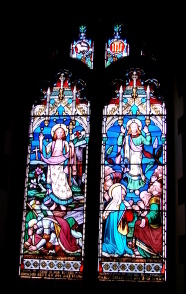 shows them blocked, including the east window. 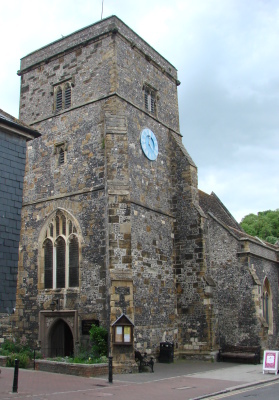 In 1807, very soon after the completion of the Sharpe drawing, the church was was said to have become ruinous except for the tower (Brent: Georgian Lewes p151) and the church was remodelled as a rectangular preaching house, as was then preferred. This entailed incorporating the chancel in the main structure. 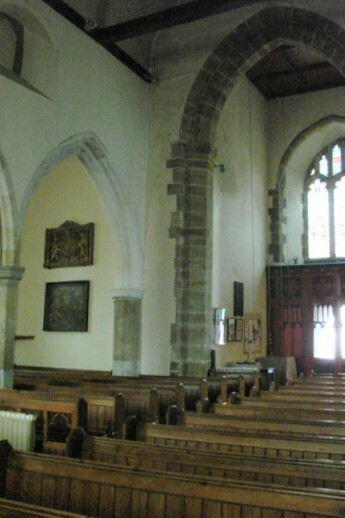 Almost certainly at this time, to facilitate the new plan, the chancel arch was removed and though the nave-arcades were retained, they were filled with galleries, if indeed this had not happened at least on the south side in the 1752 alterations. Unusually, two of the dormers on the north side which provided light for these survived the C19, though they do not open into the church. As a consequence of this work, both arcades were seriously damaged, as the C19 repairs show. Philip Currey‘s restoration began in 1877 (WSRO Ep II/17/188), though the glass in the south aisle of 1867 (B 25 p230) suggests there was earlier work which could have included alterations to the south porch. A report of Currey’s restoration in Building News in 1877 (33 p446) stated an intention to match the north aisle windows to those of the south aisle. The latter are definitely C19, so this supports the supposition of earlier C19 work. In addition to repairs to the interior stonework, including a new chancel arch, Currey refaced all except the tower in dark flint and if it had not already been done, reduced the height of the aisles. According to the same report, renewal of the chancel roof was planned, though as it is all now boarded, the age of the timbers cannot be ascertained. Further work in 1884 included the removal of a west gallery. 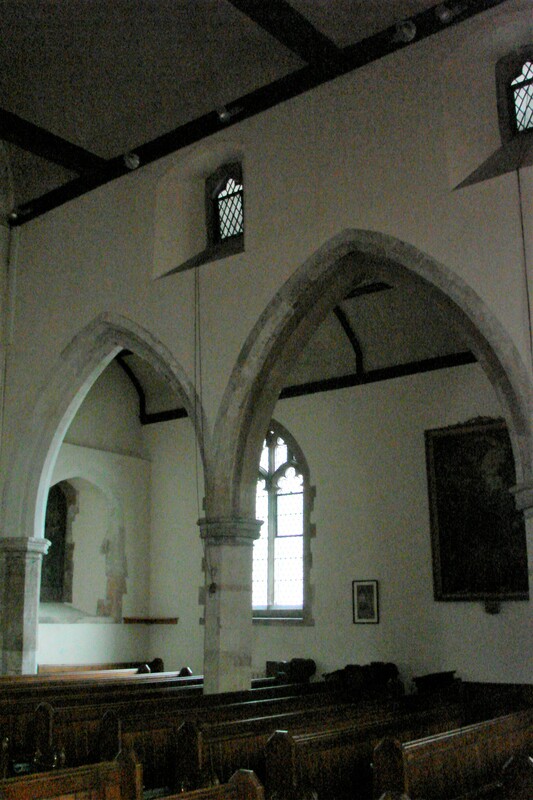 The vestry north of the chancel dates originally from the C19, but was extended in 1930 (Meads). 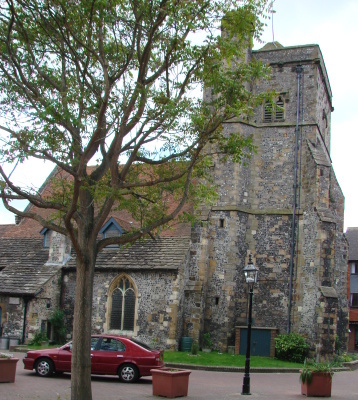 The surroundings of the church, especially on the north side, had become untidy by the 1960s. However, more recent rebuilding has created an attactive brick-paved square on that side, combined with a new church hall, revealing the north side properly for the first time. Font: C19, with a castellated top and arcading on the bowl. 1. (South east aisle, first window) W Wailes, 1867 (B 25 p230). Cheerfully old fashioned for the date. 2. (West window) J Powell and Sons, 1897 (CDG 55 p86), to commemorate Queen Victoria’s Diamond Jubilee with appropriate heraldry. The designer was F Mann (Hadley list). 3. (East window) Heaton, Butler and Bayne, c1885 (www.stainedglassrecords.org retrieved on 11/3/2013). 5. (South aisle, second window) Heaton, Butler and Bayne, 1911 (ibid). Monument: (East wall of north aisle) Susannah Bull (erected by her father John) (d1794) by W Rogerson (Roscoe p1052). Painting: Ascension, probably Flemish and C17, presented to the church in 1779 by a London art dealer, B van der Gucht. (Mitchell/Shell Guide p140). 1. (South aisle) Trefoil-headed C14. 2. (South chancel) C14, cinquefoiled with a shelf. Pulpit: Timber, 1877 (BN 33 p446). Recess: (North chancel and set very low) Shallow with a cinquefoiled head. Probably C14, but its purpose is uncertain since it seems too shallow to have been an aumbry. Reredos: 1888 of oak. Designed by T Garratt and made by H Hems of Exeter (BN 54 p828). 1. (South aisle) Queen Elizabeth I (dated 1598). 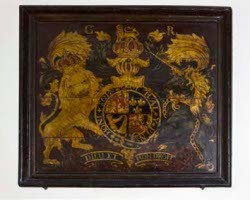 A painted plaster panel with the arms within columns. It is a rare survival, the only such in Sussex. 2. (Beneath last) George I. A painted panel with more elaborate supporters than usual. 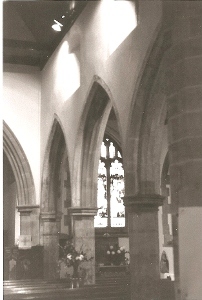 Squint: (South respond of chancel arch) Large and probably C14 with a central shaft at each end. On the chancel side the head is ogee-shaped. Stoup: (By south doorway) C14 trefoil-headed. Measured plan by W H Godfrey (?) in 2. p156 .